SAITAMA - Olympic champion Alina Zagitova took a commanding lead after the short program at the world championships on Wednesday night. The 16-year-old Russian earned a total score of 82.08 points and holds a lead of more than five points over Japan champion Kaori Sakamoto, who is in second place with 76.86. Kazakhstan’s Elizabet Tursynbaeva is third with 75.96, with two-time world champion Evgenia Medvedeva in fourth on 74.23. Rika Kihira, the favorite for the title coming into the event, is far back in seventh with 70.90 after singling her planned opening triple axel. Zagitova skated to “The Phantom of the Opera” and looked every bit the champion she was last year in Pyeongchang. She opened with a nice triple lutz/triple toe loop combination jump and went on to hit a clean double axel and a triple flip. The Russian received level fours for all of her spins and step sequence and is in prime position to win her first senior world title in Friday’s free skate. Zagitova paid tribute to training partner Tursynbaeva inspiring her this season. Sakamoto performed to “From My First Moment” and was sublime from start to finish. The Kobe native began with a fine triple flip/triple toe loop combo, before landing a double axel and went on to hit a triple loop. 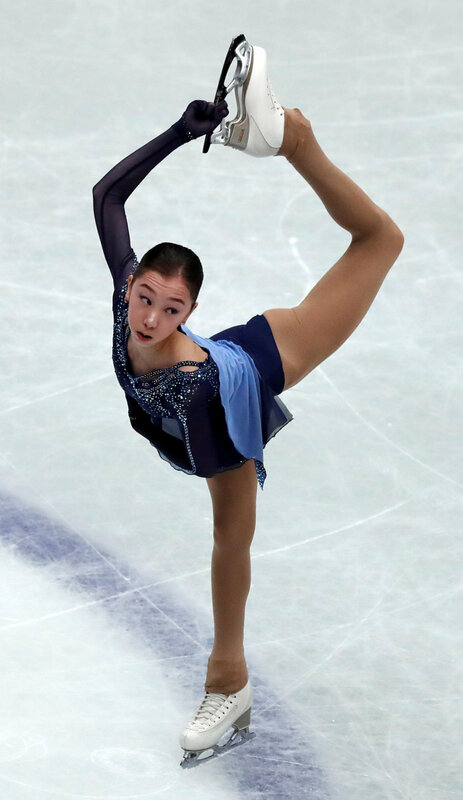 Sakamoto earned level fours on all of her spins and step sequence and looked like she would be in the lead until she was overtaken by Zagitova, the final skater of the evening. Sakamoto said she held nothing back this night. Tursynbaeva, who changed coaches from Eteri Tutberidze to Brian Orser in the offseason, continues to show great progress. 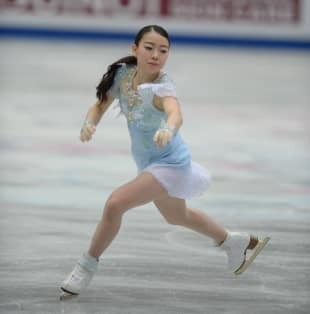 She opened with a nice triple lutz, before hitting a double axel and a triple salchow/triple toe loop combo to “Moonlight Sonata.” She also got level fours for her spins and step sequence. Tursynbaeva made clear that she will be going for it on Friday. 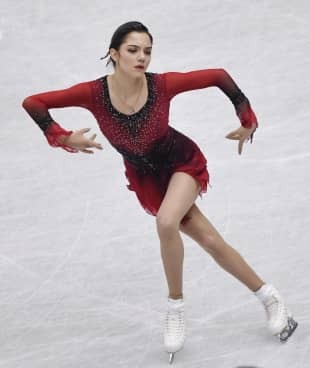 Medvedeva competed to “Tosca” and continues to show improvement this season after her move to Orser this summer. She was hit with an under-rotation on her opening triple flip/triple lutz combo, but otherwise put in a solid effort. Kihira skated to “Clair de Lune” and had a calamitous beginning. The Grand Prix Final champion lost huge points for her mistake on the axel. She recovered well, but the damage was done. She will have a lot of ground to make up in her free skate if she is going to contend for a medal. Satoko Miyahara (70.60) is behind Kihira in eighth place. Miyahara skated to “Song for the Little Sparrow” and came perilously close to falling on her opening triple lutz/triple toe loop combo. She looked seriously off balance in the air on the lutz, but somehow righted herself in the air. The triple lutz was under-rotated, however, and her chance at a medal appears remote. 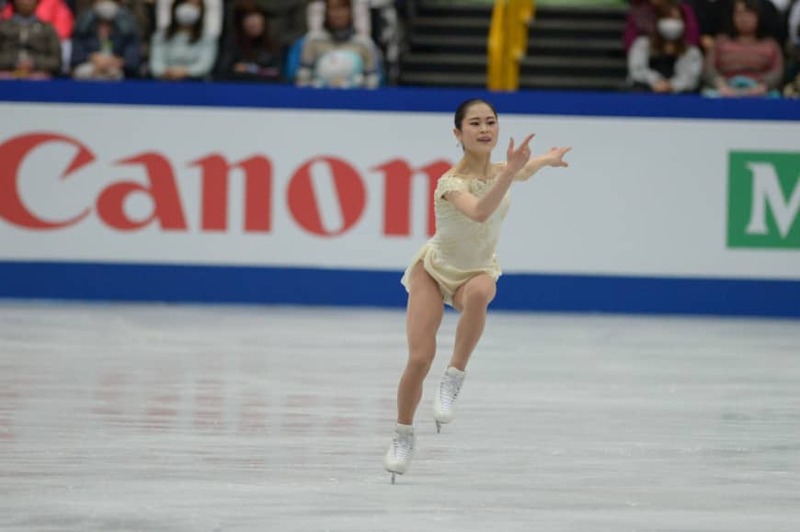 Miyahara analyzed her performance and identified what she felt the problem was. Evgenia Medvedeva is in fourth place with 74.23 points after the short program. Last year’s winner, Kaetlyn Osmond of Canada, did not compete this season. Russia’s Evgenia Tarasova and Vladimir Morozov lead the pairs after the short program with 82.21. China’s Sui Wenjing and Han Cong (79.24) are second, with their compatriots Peng Cheng and Jin Yang (75.51) in third. The men’s short program is set for Thursday.